Do you remember Flo from Mel's Diner? Whenever someone did something she didn't like she would yell "kiss my grits"
When my oldest daughter was three, we took her to Disney World. While there, we decided to go to a rather fancy restaurant for dinner. She decided that she wanted a cheeseburger and no matter how much we told her they didn't have cheeseburgers and offered her alternatives she wasn't buying it. Peanut butter and jelly, anyone????? You don't have to be from the south to love grits, but if you are from the south, I bet you have a favorite grits recipe. Mine is Cheese Grits Casserole. Preheat oven to 350°. In a large saucepan, bring water to a boil. Slowly stir in grits and salt. Reduce heat; cover and simmer for 5-7 minutes or until thickened. Cool slightly. Gradually whisk in milk, butter and eggs. Stir in cheese, Worcestershire sauce and cayenne. Transfer to a greased 2-qt. baking dish. Sprinkle with paprika. Bake, uncovered, 30-35 minutes or until bubbly. Let stand 10 minutes before serving. Yield: 8 servings. I think I just heard the sound of rain outside. It can't! It wouldn't! lol. Cute kid anecdote. :-) And as for grits, I hadn't tasted grits until I was in my mid 20s. They're not on any menu here in NW Wisconsin. lol And actually, that was the one and only time I ever ate grits - or ever saw them anywhere. They were made by a friend who spent her winters in Florida. Figures, right? I'm a grits gal and yes, I moved some over to Germany because I couldn't survive without grits. I love, love me some shrimp and grits....yummy! Funny story! I love grits and yes I do love cheese grits also. How funny! I'm Southern through and through....but I've never eaten grits! lol What am I missing? Hugs! Cute story and great recipe. Hope it isn't raining again for your sake. Love this! Yes.. I do remember this .. and yes I eat grits! My dad grew up in New Orleans and grits was one of his favorites. He used to say "would you like a little sha-ga (sugar:) on your grits?" and always butter! I always make grits casseroles around the holidays. I'll flag the recipe! Love that story!!! I love, love grits. They are like motherlove in a bowl to me. thanks for the recipe! Too funny!! 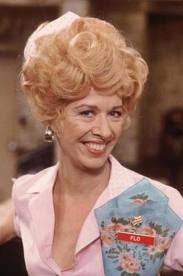 And yes, I remember Alice -- and Flo from Mel's Diner. you can't beat a good shrimp + grits, but it's the cheese grits that are a staple in our home. love me some southern grits! Funny story. I used to love that show! I am a native southerner and LOVE grits! But......would you believe I just eat the instant kind? I know. Shameful. I would like to try your recipe though. It sounds yummy. I remember Flo well. Loved that show when it used to come on tv.